Hi, it's Sunday to it's time again to share a card made with stamps from I Brake For Stamps. Here's a friendship card made with Sending Smiles and Funky Cone Flower. When buying a stamp, keep in mind you don't always have to use all of the stamped image. 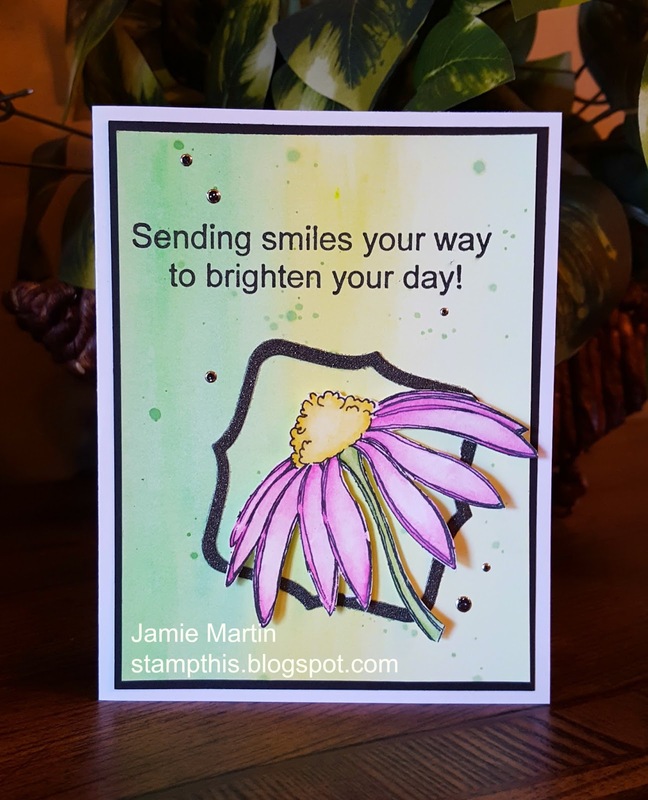 The Funky Cone Flower stamp has a pretty swirl background around the flower, but today I'm only using the flower part of the stamp. 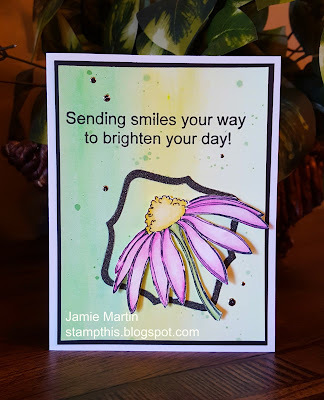 You can see a card I made HERE that used all of the stamped image. 1. Stamp Funky Cone Flower on watercolor paper with Onyx Black VersaFine ink, heat set and color only the flower with Staedtler colored pencils. Cut out the flower only and set aside. 2. The background panel was made by scribbling different colors of Gelatos on watercolor paper and it was then rubbed with a baby wipe to blend. Once dry, I rubbed Mowed Lawn Distress Ink on my craft mat and picked it up with a wet paint brush and flicked water drops on the panel and let it dry. 3. Stamp Sending Smiles at the top of the panel with Onyx Black VersaFine ink. 4. I diecut a frame from black glitter paper and glued it to the panel with Art Glitter glue. 5. The Funky Cone Flower was popped up over the frame with foam squares. 6. Black Dot Sparklers were randomly place on the panel. 7. The panel was layered onto a larger black panel and glued to a white card with Zip Dry Glue. If you buy anything from the I Brake For Stamps website, be sure to use the coupon code SAVE10JAMIE to receive 10% off your order.